Graffiti or Art? — Beauty may be in the eye of the beholder but these ‘eyes’ are no more after ‘The Rocks’ were removed this week. The large concrete slabs in Paint Creek near the Clarkston and Kern roads intersection have restricted the flow of the creek for decades. 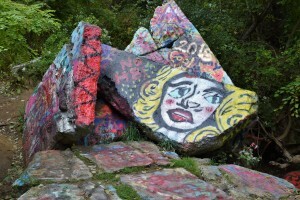 It’s also been a long-standing tradition for vandals to paint graffiti and messages on the rocks, leeching paint into the natural watershed. Now, Orion Township is removing “The Rocks” from Paint Creek. 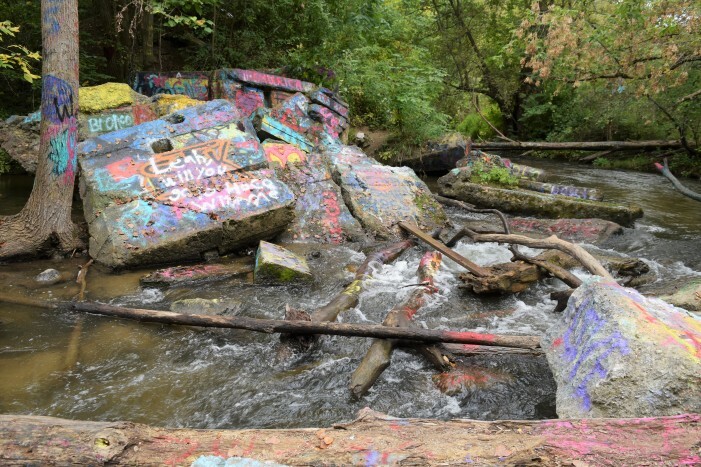 Despite the local love of “The Rocks” and the tradition of spray painting graffiti, homecoming proposals and often profane messages on the concrete slabs, the tradition is an ecological nightmare for the creek and its wildlife. “We’ve been working toward it for quite some time. There’s latex-based, oil-based paint leaking into the watershed – it’s not a natural substance that should be flowing through the creek,” said Orion Township Parks Director Aaron Whatley. “It’s also one of the last cold water reproducing trout streams in southeast Michigan. 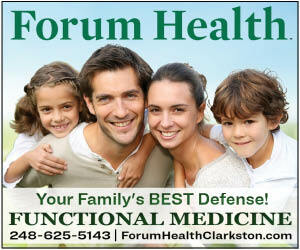 We’d like to preserve that resource,” Whatley said. The remnants of the Rudd Mill Dam – locally known as “The Rock” – have sat in the creek for more than 100 years, according to a press release from Orion Township. The project is being done pro bono by two companies that agreed to assist the township with the removal of the rocks. Staging to remove the concrete slabs began on Monday, with removal on Tuesday and Wednesday. Superior Excavating will provide the heavy equipment, with one excavator staged down at the rocks to break up the concrete slabs. A second excavator will be positioned atop the hill, and the first excavator will pass up the debris to the hilltop excavator, which will then load it into trucks. Orion Township business Warren Aggregates, LLC, will haul away the rocks for crushing. 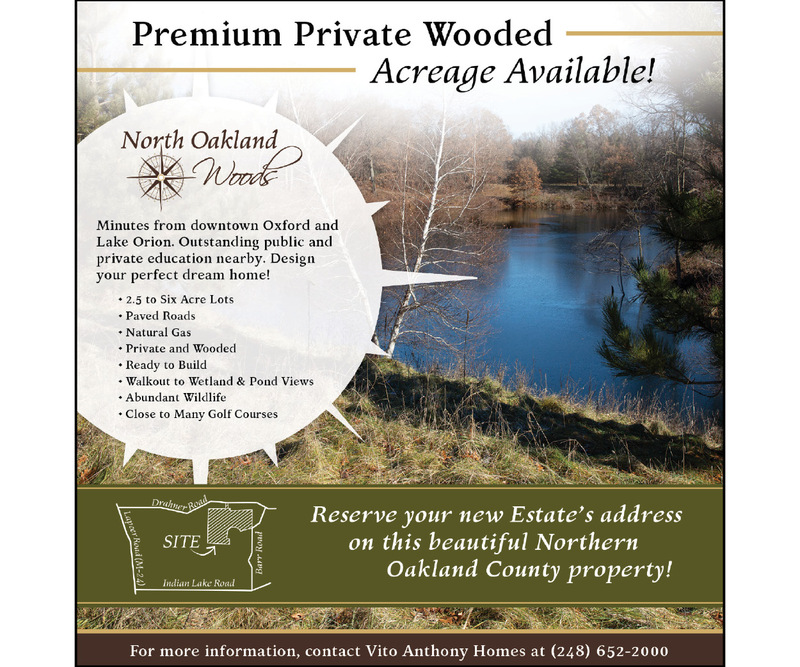 “After months of planning and coordinating with many local, state, nonprofit and private partners, on September 25, 2017, Superior Excavating began work in the area of Clarkston Road and Kern Road removing the Rudds Mill Dam remnants. “The removal of the Rudds Mill Dam remnants is truly a great day for our ecosystem. For over 100 years the remnants of the dam has been restricting the natural flow of Paint Creek. We are extremely fortunate to work with so many dedicated individuals in our community. Matt Einheuser of the Clinton River Watershed Council said the concrete slabs alter the natural flow of the stream and, along with the debris collecting around the slabs, create a damming-effect.